It’s crazy, but in the build-up I heard several analysts refer to this a ‘season defining game for Arsenal’. This was directly the result of our poor performance in the first game and the danger that, like last year, we would get off to a poor start and never recover. So by comparison, let’s hope that today was also a season defining game for Chelsea! More on that later. I am by no means short sighted enough to buy into that theory for Arsenal Sunday, but this game was definitely an important one. A lot of analysts, seeming now in love with Pardiola, predicted a draw or palace victory, and personally I did feel we would get a real test. 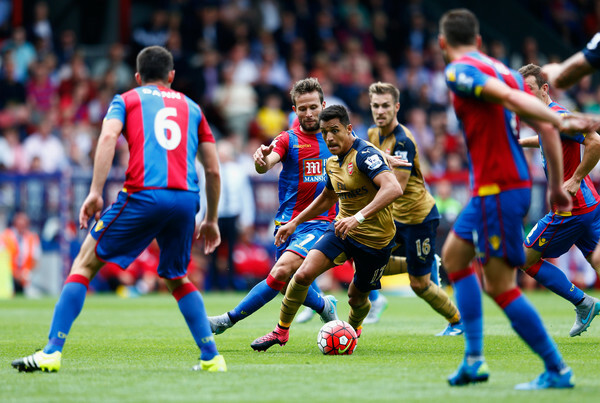 Fortunately it seems that Arsenal love a 2 – 1 over Palace. Was a nervy game Sunday, but we were well worthy of the three points, ‘Agent Cech’ looked more like his old self (thank god) and we generally looked a lot more in control. Honourable mentions for Nacho, Ozil and Cazorla, who I thought had particularly good performances today. Generally despite one incident where we failed to close down their right back and paid for it, we look pretty solid. Oh, and of course the moment that Connor Wickham stopped my heart by smashing one against the upright. Sanchez looked mildly off his best, but that is still a lot better than most, topping his performance by embarrassing a defender, leaping over him with trademark Sanchez desire to set up the winning goal. Then there was the second game of the day, which arguably I enjoyed more than the first. Despite the fact that City look terrifying and the team to beat this year, nothing gives me more pleasure that watching a Mourinho team dismantled so easily, his face throughout, then to top it off his mental unravelling in the post-match interview. I think that will have me smiling all week. He really may be losing it this time. If I was Wenger I would be licking my lips for next week’s press conference. Fortunately for the clubs long-term image, I think the boss will not comment and just rise above it, and also fortunately I think that will wind Jose up even more. I hope that a least Wenger had the pleasure of bellowing with laughter on his sofa with his wife while watching it all unfold on Match of the Day…. in a French accent….. “Did you just hear what he said?!!! FAKE RESULT hahahahaha. Maybe he is a specialist in… in… DELUSION, hahahaha!!! Please tell me you recorded this on the DVR Annie, I will be watching this more than once”. Liverpool next Monday. Let’s make a statement and build some momentum.